I get so many people commenting on how cute it is. The yellow green color is perfect.The fabric is like a satin ribbon with the center a perfect rose petal. This goes well with my tiffany lamp with blue, green and orange glass. Looks very feminine. Incorporate classic romance into your home decor with this attractive throw pillow. Available in a variety of romantic colors to complement an array of decors. This gorgeous round pillow provides textural style for your bedroom, study or reading nook, whether placed on your bed, a chair or sofa. Use multiple pillows or multiple colors to give your room the look of a garden, is is constructed of an exquisite Georgette material and provides a zipper closure for pillow insert removal and easy care. Dimensions 16.0 In. X 16.0 In. X 2.0 In. Dissapointed. White stitching on red pillows. I ordered 2 red pillows and received 2 red pillow covers with NO inserts. The descriptions says the pillows have inserts but I didn't receive them. If you zoom on image you can see the white thread used on the red material. I didn't notice it when ordering, but it's very noticeable in person and in my opinion makes them look cheap. I returned them. Exactly what I was looking for as an accent pillow for bedding. The color (champagne) is spot on. Item did arrive in vacuum sealed package, so it comes flat. Because it is zippered, I plan on getting some stuffing from a craft store to make it fuller, which is why I am not giving a full 5 stars, but design wise it's spot on and well made. LOVE THIS PILLOW!! I purchased the red and the color is perfect! This pillow is even more than I expected. A throw pillow can make all the difference in a room and it adds just the right touch to pull it all together. This one is perfect! We ordered a second chocolate color pillow to get with one we purchased a few weeks earlier. The color is lighter than the first. They are beautiful, however, and really dress up the bed. I ordered 2 of the red pillows. Were fairly flat when they arrived but have plumped up nicely. They are a beautiful deep rose-red color and are a lovely addition to my sofa! Well-made material and feminine... to add just the right amount of romance to my home. I bought silver and I love this pillow in person. It looks classy instead of "cheesy", like others I've seen. I'll be pairing it with light gray and white pillows. Great buy! 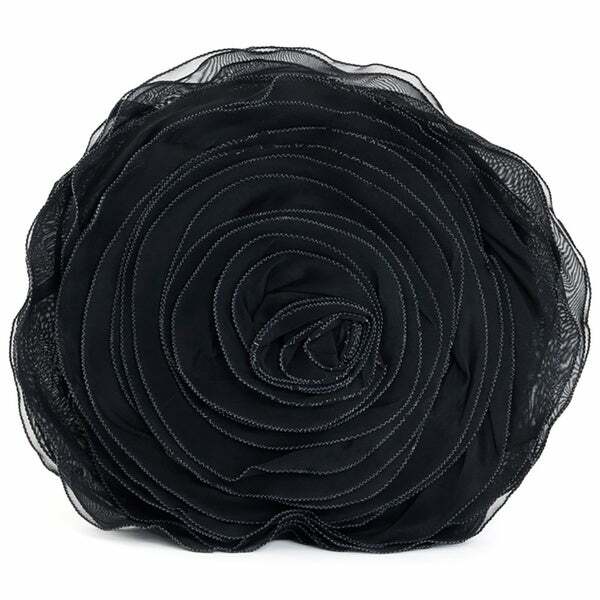 Love this rose pillow ! Looks amazing and good quality ! Beautiful accent piece! Quality is amazing...with double the price. Using in lr/gr...a bit shiny but still works. Perfect color...wishing it came in white to nestle amongst bedroom pillows. Great color! I chose silver. 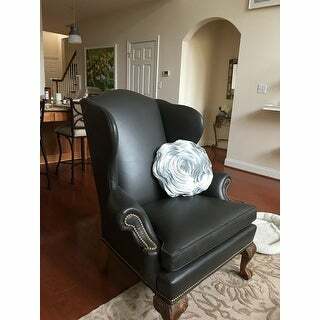 We got the silver Rosset pillow and it is beautiful! They look beautiful on the maroon couch, and sitting near the Rose rug, all of which I purchased from you. gorgeous and love the pillows. I ordered three colors, very beautiful design, however, as they come in compressed package, need to fluff them up for a while. Would recommend. Loved it was gorgeous and just like described. Added an extra flare to my bedding set. This pillow is so beautiful and silky. I purchased a red, grey and a black one and they are all gorgeous! Love! I LOVE this! I created a glam/chic bedroom and this was a fun addition to the bedspread set I had purchased. This adds a fun feminine flair without being too much! A MUST have! It's a very different design with a unique elegant look. I had to have this pillow when I saw it. "What is the color of the "sage" pillow? "Sage" generally indicates a green color, but the photo looks cream." Hello CathyBL1, we apologize for the confusion. Colors may vary slightly due to monitor settings. The sage is a neutral sage green color with gold undertones. Thank you for shopping with us! A.C.